Decision pending: The U.S. Fish and Wildlife Service is still considering whether or not a hunting trophy, the head of a black rhinoceros killed legally under the terms of a hunting license, may be imported into the USA. Dallas-based big game hunter Corey Knowlton has been waiting for over a year for the authorities to come to a decision. In the months following the macabre Safari Club rhino kill auction in Dallas, conservationists bombarded the U.S. Fish and Wildlife Service with petitions. 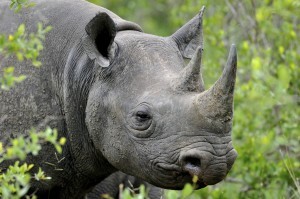 135,000 individuals signed the plea to enact a ban on the import of rhino trophies. Never before had the US government bureau experienced such intense public pressure regarding an individual decision. For his part, auction winner Corey Knowlton threatened to demand his license fee back should the USFWS bow to the will of the protesters. Because, he reasoned, hunting made no sense without the trophy. The US bureau has taken its time deliberating this delicate matter. Perhaps the US authority responsible for wildlife protection is worried about protecting its own image. It wouldn’t look good to stand accused of helping the big game hunting lobby and the WWF transform southern Africa into a veritable – and highly profitable – endangered species slaughterhouse. 4. Huntnamibia, 2014, page 69 ff. Stop hunting Rhino and Elephants. Trophy hunting should be abolished completely! Anyone who thinks that Killing is Conservation is an IDIOT – or, more likely a LIAR. You don’t save a species by killing members of it – for any reason. DSC is pushing this hunt as some form of Conservation, which is pure BS. They have the resources to purchase the Rhino (alive ) and have it relocated to a secure location – where perhaps it’s genes could be preserved for possible future artificial insemination – but CONSERVATION IS NOT WHAT DSC IS ABOUT – KILLING IS WHAT DSC IS ABOUT. Aloha, What a neanderthal mindset these “hunters” have, if allowed these small minded, short sighted murders would kill every indangered animal they can buy. This country must make it a crime to inport so called trophies like this. Many states are making it a crime to inport ivory, the same must be done with all indangered animals. The argument for well managed trophy hunting aiding the conservation of wildlife is well supported by well credentialed authors publishing in peer-reviewed scientific journals; the arguments against hunting aiding conservation are invariably written by unqualified journalists or “conservationists” with no relevant formal training, publishing in non peer-reviewed blogs or other on-line media. Historically, denial of Truth is nothing new of course and was elegantly examined by Professor Tony Taylor is his 2009 book ‘Denial: History Betrayed’. Observing the behaviours and tactics of anti hunting ‘Denialists’ is just like reading the chapter on denial of the Holocaust in Taylor’s book. Abolish totally the heinous hunting of defenceless animals. Thank you Huismann of your book. Trophy hunting is the con in conservation. It is a big shame to WWF and IUCN and the likes to be involved in this bloody business. Soon everyone in the world will know and WWF who has cheated a lot of people intentionally by letting them understand they are the voice for endangered animals, will loose a lot of supporters. Then all is left will be a lie. WWF – you have deceived the public and your donors for a very long time. Not anymore. You cannot “save” an animal by slaughtering it. I guess the words “World Wildlife Fund” which we were stupid enough to believe meant for SAVING animals actually means for selling permits to kill their dwindling populations. Shame on you.